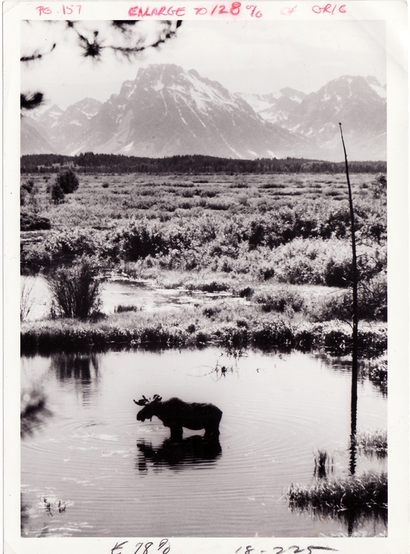 Around 1972 during a family trip to The Tetons in Wyoming, Kent spent many hours hunkered down in a pup tent waiting for a moose to come to this watering hole. Before the trip I remember seeing him spray paint the beige tent with green and brown paint, making it a camouflaged tent. He brought with him a small wood stool that opened up with canvas across it. He sat on this tiny stool and spent a couple days waiting for the moment when the moose would wander into the watering hole. The moose finally showed up and Kent got the shot. Unfortunately he also damaged his lower back and spent the next year recovering from back disk surgery. This print has his notations on it about how it was going to be used. This image was used in the book A Fine and Peaceful Kingdom.